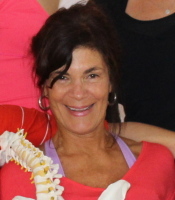 Nancy is a certified Pilates and Gyrotonic Instructor working out her studio Coastal Groove in Galveston, Texas. Nancy’s passion for helping those with scoliosis led her to eventually begin a group class for Scolio-Pilates™ from the many private clients she was seeing. And group Scolio-Pilates™ is great. Everyone benefits, not only from Nancy’s knowledge but from the support of the other students in class going through the same experiences.